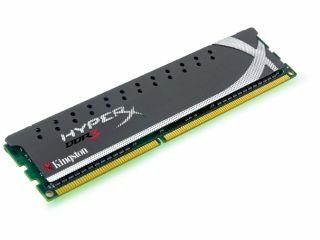 Talking with memory stalwart Kingston today it was mentioned that we could expect to see Sandforce-powered SSDs released under the enthusiast class HyperX branding in the first half of this year. It's the first time the manufacturer has gone into the enthusiast market with a high-end SSD drive. "We've been getting by with mainstream drives," said a Kingston rep.
And he's right: the V+ series of SSDs have struck a great balance between price and performance, offering decent solid state performance for a fraction of some of the competitor's offerings. The HyperX SSD will come out at the top-end of the market with the next generation of the Sandforce controller, running on the SATA 6Gbps interface. This is part of an increased push for the HyperX branding. As well as the new steely HyperX dual-channel memory modules for the Sandy Bridge platform, including the first 8GB 2,133MHz kit to go through the full Intel XMP testing, there has also been the HyperX Max USB 3.0 drive. As soon as the Sandforce controller is out in the wild, we should see these new Kingston drives adding to that growing list.